I try to answer common questions from young people interested in spell crafting and a lot of people have questions about closing their circles and wanting to know how to close the wiccan circle in the ‘right way’. There is not specific way to close your spell crafting circle. This article is a guideline for future reference and I hope it gives you enough basic information to expand upon your own knowledge and style. You can find many traditional ways of doing things by reading and researching but I think the beauty of finding your path and modifying the ways things were done in the past breeds creativity and bring joy to the art that is witchcraft. 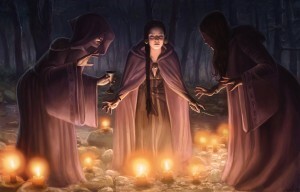 When you are done with your spell or ritual it is common to close the crafting circle. The most common way to close your circle is by reversing what you did to open the circle. Thank the Guardians and mentally send the light of the candles to the Universe or whoever you have in mind that needs it. If you have candles and they were lit in a particular order then put out the lights in the opposite order. Let this circle come uncast but never be unbroken. Merry Meet and Merry Part until we Merrily Meet again. As I will it so mote it be. Leave any altar or holy ritual candles to burn down completely. I hope this reference was useful and helpful to you for your future spell workings and crafting. Please leave your wiccan circle closing rituals for inspiration below. We are a community and it is nice to converse and share ideas with one another. Witchcraft is unique and self inspired. There is a lot of controversy surrounding finding your own path and moving from the strict rules that previously dominated the religion but please be true to yourself. Thank you for visiting!